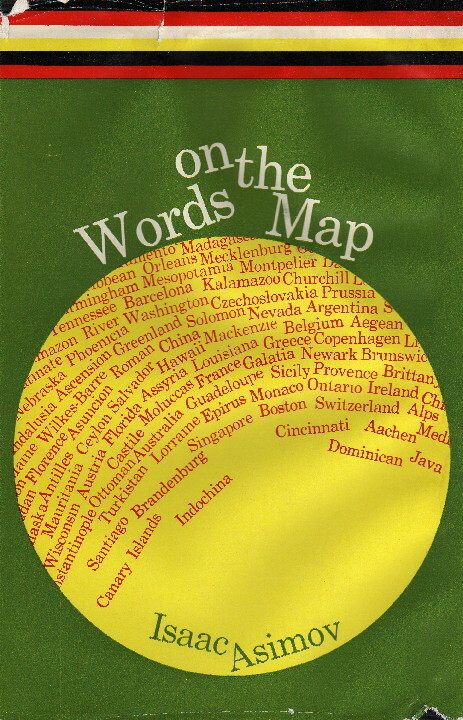 In his newest book of language exploration, Professor Asimov ranges over the whole world, digging up the roots and histories of hundreds of place names from Aachen (derived from the Latin “Hot Springs”) to Zanzibar (“land of the Zenj”). The words on our maps are, after all, but a kaleidoscopic reflection of human history and the book is overflowing with a thousand surprising and fascinating bits of information. The Roman Caesars, for example, have left their mark in many cities, but who would suspect that New Jersey is named for them; or that the Canary Islands are named not for the birds, but for the wild dogs that lived there? Residents of Iowa may be surprised to learn that the name presumably means a place of “the sleepy ones,” while New Yorkers commemorate the yew tree. As with the now classic Words of Science, the book is divided into 250 one-page essays, in which over 1500 names are discussed. All of the states and major cities of the U.S. are covered as well as most of the major cities and countries throughout the world along with their mountains, rivers, lakes, and seas. The book is a continuously informative and entertaining, whether you pick it up for five minutes or settle down it it for a whole evening. Finally, for the curious adventurer who sets out to roam through this volume there are two indexes (one for people and one for places) to help chart the way. Here is a completely different kind of geography that will pique the interest of readers whatever their age. As for the subject matter, it’s pretty complete. I’m not going to actually count but I’m pretty sure that all fifty states, most of the provinces of Canada, and every country in the world is covered. Every country, that is, as of 1962. Herein lies the books peculiar weakness. Science and history tend to progress in a cumulative fashion—while older results and ideas are on occasion invalidated, the main problem with older books tends to be what they leave out, not what they get wrong. Thus, most of Asimov’s non-fiction can still be read for profit. Words on the Map, however, suffers the battering of more than thirty years of a changing globe, and they have not been thirty calm years, either. The western hemisphere stands pretty much as it did thirty years ago, and names of American states and Canadian provinces have not altered—but the countries of the eastern hemisphere have been in constant flux. Some new countries have come into being (Bangladesh, a united Germany and united Vietnam), some have vanished (the Soviet Union, Yugoslavia, Czechoslovakia), and numerous countries or cities have changed their names (the Congo to Zaire, Burma to Myanmar, the PRC insists on Beijing and Guangzhou instead of Peking and Canton, and nobody calls Taiwan Formosa anymore). So while there is little that can be said to be left out (I’m disappointed that Gibraltar is included but Hong Kong and Macao are missing), the book does lock one into a time-warp into the 1960’s and leave surprising holes in modern geography. There is still a lot of useful information here, but one needs to be pretty familiar with the modern globe to know what parts of the book are no longer relevant.